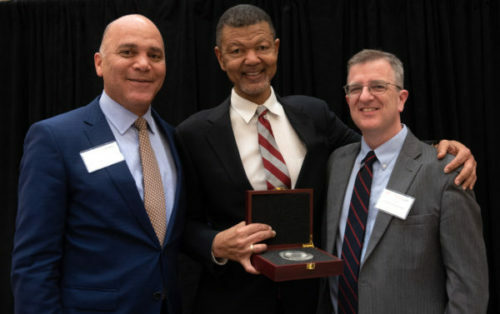 Gary Bledsoe ’76 has been named the winner of the 2019 Virgil C. Lott Medal, an honor presented every two years by the School of Law to recognize those who uphold the values of Virgil Lott ’53, the school’s first African-American graduate. Bledsoe, the longtime president of the NAACP’s Texas chapter, and currently the Dean of the Thurgood Marshall School of Law, was presented with the medal during a gala dinner on February 7. Gary Bledsoe, distinguished Austin lawyer and permanent class president of the Class of ’76, has not only made incredible contributions to the legal profession but has also worked tirelessly to advance civil rights by educating the next generations of world-class lawyers. He served as a Texas Southern University regent from 2007 to 2017 and has also served as President of the Texas NAACP since his election in 1991. 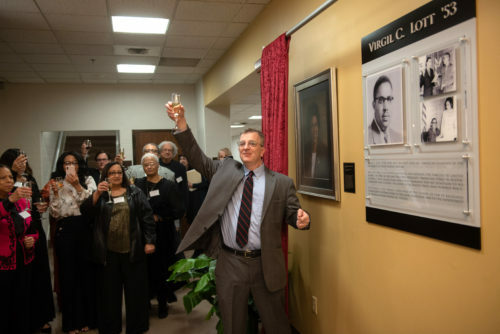 The celebratory evening began with the unveiling of the new Virgil C. Lott commemorative display. Dean Ward Farnsworth led the smiling circle of family members and dear friends in a champagne toast to Lott’s extraordinary life and legacy. Following the unveiling, guests gathered in the Atrium and enjoyed welcoming remarks by the Dean and Virgil C. Lott’s daughter, Joycelyn Lott Toliver. 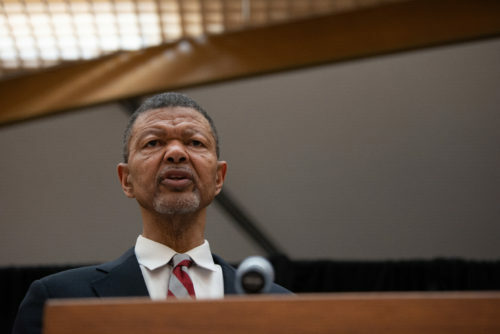 Although Senator Rodney Ellis ’79 was unable to attend in person – as he too was receiving an honor that evening – he made his deep regard for both Bledsoe and Lott know by way of a heartfelt video tribute. Chief Justice Jefferson ’88, a prior recipient of the Virgil C. Lott medal, then took the podium to express his admiration for and give congratulations to Dean Bledsoe. Applause echoed through the law school as Bledsoe accepted his medal from Jefferson and Dean Farnsworth. It was with great humility that Bledsoe expressed his gratitude for this honor. He implored us all to do our part in making a more just and equitable world. Recipients of the Virgil C. Lott medal are chosen by a distinguished committee headed by Dean Ward Farnsworth, former Dean Larry Sager, and previous winners. Previous recipients of the Virgil C. Lott Medal are Former Chief Justice of the Texas Supreme Court Wallace B. Jefferson ’88, Texas State Senator Rodney Ellis ’79, the Honorary Ron Kirk ’79, former Mayor of Dallas and the U.S. Trade Representative from 2009 to 2013, and Myra McDaniel ’75 Texas’ first African American Secretary of State.